Lunch with reporters and editors in Casablanca. Abu-Fadil with chief editors of Arabic news at Casablanca’s “2M” and RTM-RTV channels. IPJ director speaks to ISIC administrators and faculty on new trends in international media. With ISIC director Latifa Akherbach, U.S. Embassy Information Officer Monique Quesada and journalism school faculty. 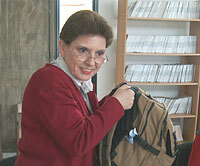 Demonstrating “backpack journalism” in Rabat. Abu-Fadil discusses media ethics with ISIC students. ISIC students learn about conflict of interest. Online journalism workshop for ISIC students. “Art of the interview” workshop at ISIC. Abu-Fadil with director and students of Rabat’s Institut Superieur de l’Information et de la Communication. Abu-Fadil flanked by journalists in Tangiers following open discussion on media’s role vis-a-vis Middle East developments. 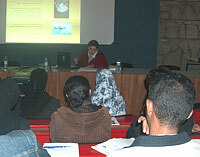 Students at Casablanca School of Journalism at lecture on media ethics. Dris Aissaoui, editor-in-chief of media group including Maroc Soir, Le Matin and Morocco Times receives IPJ director at paper’s Casablanca offices. 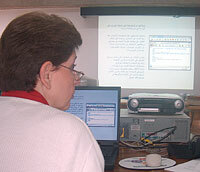 Duplicating the Institute for Professional Journalists’ previous North Africa successes, director Magda Abu-Fadil toured Morocco in May 2004 to teach communicators how to improve their skills. During a week-long visit, she conducted workshops and lectured on ethics at media-related events as a guest of the U.S. State Department’s Africa Regional Service bureau and the U.S. Embassy in Morocco. Her visit to the leading station culminated in a live interview on “2M’s Arabic nightly newscast to discuss media globalization and ethics. The following day, Abu-Fadil traveled to Rabat where U.S. Information Officer Monique Quesada accompanied her to the Institut Superieur de l’Information et de la Communication to meet with director Latifa Akharbach and senior college officials. Abu-Fadil first spoke to ISIC professors on new trends in international media before being hosted by the school of communication’s faculty to a working lunch that included officials from the Moroccan Ministry of Communication. She returned to the institute to lecture on “Media Ethics and Freedom of Expression in the Arab World” to journalism and communication students. Abu-Fadil also traveled to northern Morocco to participate in an open discussion with regional journalists from Tangiers and Tetouan on “The Role of Arab Media in the Context of Recent Middle East Developments.” Her visit to Tangiers enabled her to make contacts with other than mainstream reporters, editors and producers in the capital and leading commercial centers. She ended her tour with a discussion/presentation on media ethics with students and faculty of the Casablanca School of Journalism.